The two-stage Falcon 9 launch vehicle lifts off Space Launch Complex 40 at Cape Canaveral Air Force Station carrying the Dragon resupply spacecraft to the International Space Station. A care package with more than 5,800 pounds of supplies from Earth is on its way to the International Space Station aboard a SpaceX Dragon spacecraft. 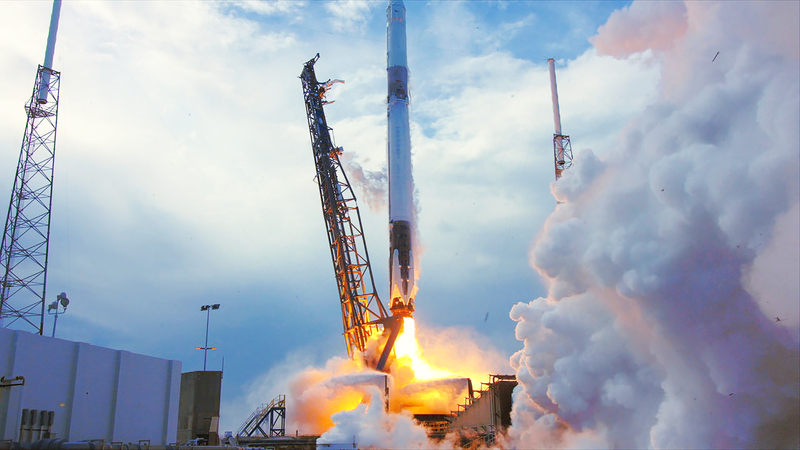 The company’s 14th commercial cargo mission to resupply the space station began at 4:30 p.m. EDT with liftoff aboard a SpaceX Falcon 9 rocket from Space Launch Complex 40 at Cape Canaveral Air Force Station in Florida. The Dragon spacecraft now is in orbit with its solar arrays deployed and providing power. With the countdown clock in the foreground, a SpaceX Falcon 9 rocket lifts off from Cape Canaveral Air Force Station launching a Dragon spacecraft with supplies for the International Space Station. During a prelaunch news conference, Pete Hasbrook, NASA’s associate program scientist for International Space Station Program Science Office at the agency’s Johnson Space Center in Houston, praised the work of Commercial Resupply Services companies. 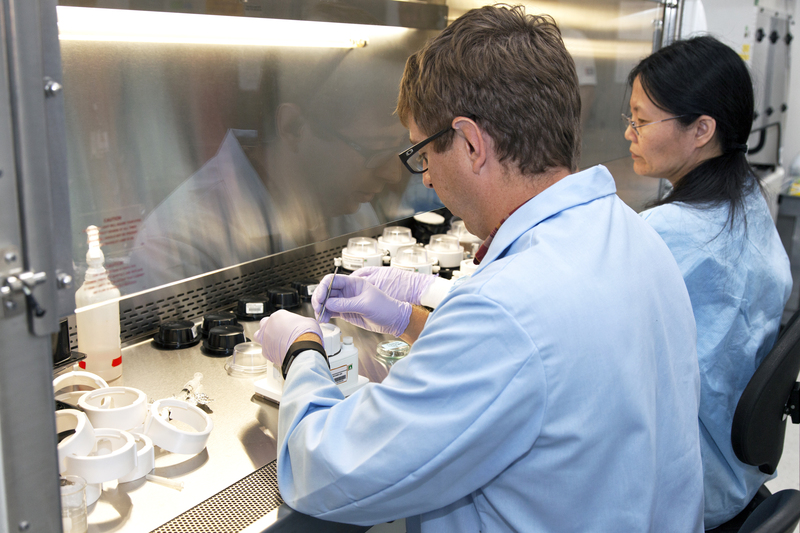 Project scientists Matthew Romeyn, left, and Dr. Ye Zhang place seeds in Veggie Passive Orbital Nutrient Delivery System (PONDS) units inside a laboratory at the Space Station Processing Facility at NASA’s Kennedy Space Center. The Dragon spacecraft will spend approximately one month attached to the space station. 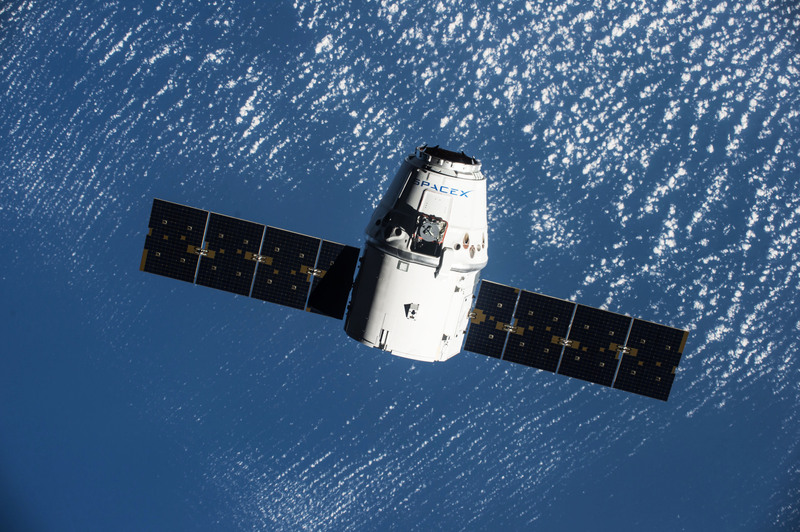 Unberthing and release of the Dragon from the space station is targeted for May 2. About five hours after Dragon leaves the station, it will conduct its deorbit burn, which lasts up to 10 minutes. It takes about 30 minutes for Dragon to reenter the Earth’s atmosphere and splash down in the Pacific Ocean off the coast of Baja California. 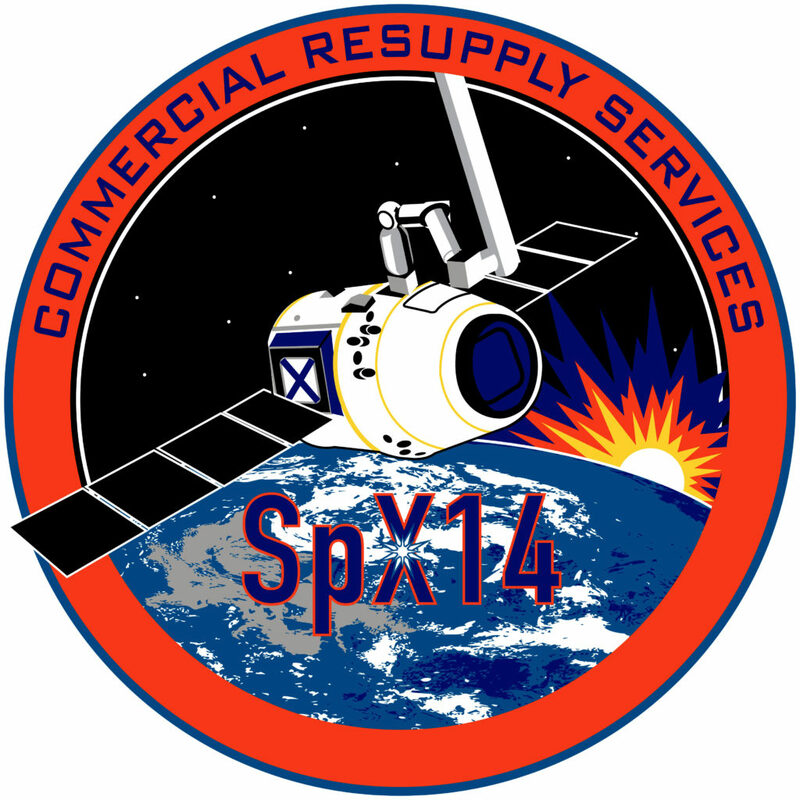 This concludes today’s coverage of the SpaceX CRS-14 countdown and launch. Thanks for joining us. 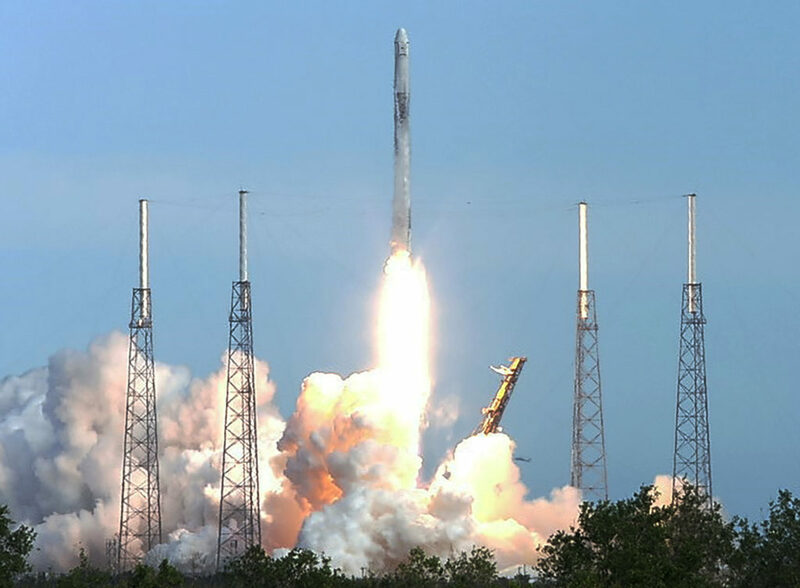 3 – 2 – 1 – Zero — Ignition and liftoff of the SpaceX Falcon 9 rocket and Dragon spacecraft, for the company’s 14th mission to deliver supplies, equipment and science materials to the International Space Station. 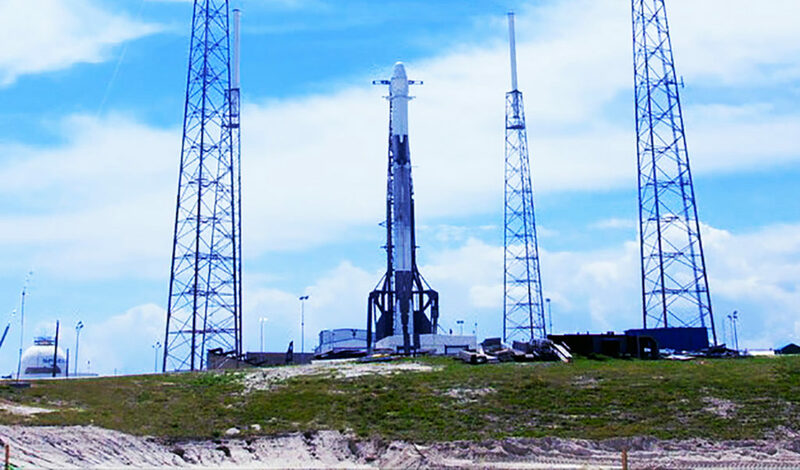 The vehicle is quickly climbing away from Space Launch Complex 40 at Cape Canaveral Air Force Station in Florida. The Falcon 9 rocket’s first-stage also has completed its work and has separated from the vehicle. 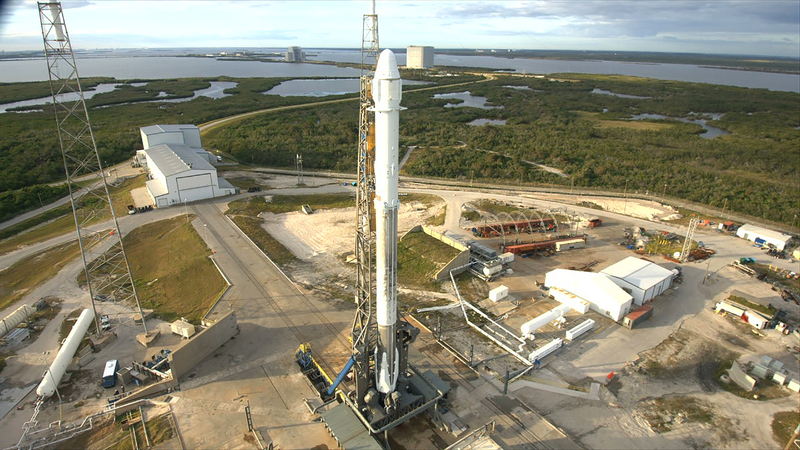 The countdown continues toward liftoff at 4:30 p.m. EDT. 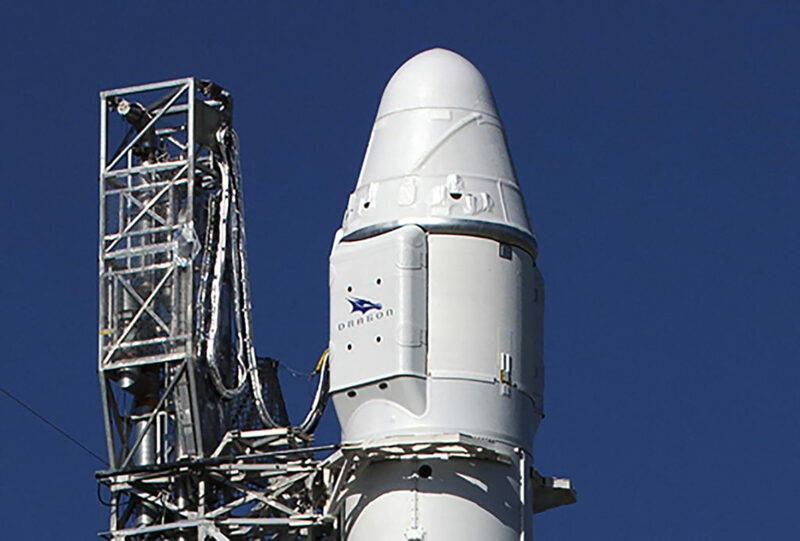 Starting at about seven minutes before launch, the Falcon 9’s engines will be chilled to condition them for the super-cold oxidizer — liquid oxygen. About three minutes prior to liftoff, the umbilical tower-like strongback support structure will be lowered away from the rocket. With about 60 seconds remaining, the flight computer will run its prelaunch checks and the rocket’s propellant tanks will be pressurized. The terminal stage of the countdown begins at T-minus 30 seconds. A Falcon 9 rocket stands ready for liftoff in this file photo from Cape Canaveral Air Force Station’s Space Launch Complex 40 to boost a SpaceX Dragon resupply spacecraft to the International Space Station on Dec. 15, 2017, for SpaceX CRS-13. Weather forecasters with the U.S. Air Force’s 45th weather squadron at Patrick Air Force Base are calling for an 80 percent chance for favorable conditions for launch. The primary launch weather concerns are flight through precipitation and cumulus clouds with the showers. What’s on Board Dragon for SpaceX CRS-14? During SpaceX’s 14th Commercial Resupply Services Mission to the International Space Station for NASA, the Dragon spacecraft is packed with more than 5,800 pounds of supplies, equipment and several science investigations for the crew aboard the station. The Atmosphere-Space Interactions Monitor (ASIM) surveys severe thunderstorms in Earth’s atmosphere and upper-atmospheric lightning, or transient luminous events, from its perch on the exterior of the European Space Agency (ESA) Columbus module. These include sprites, flashes caused by electrical break-down in the mesosphere; the blue jet, a discharge from cloud tops upward into the stratosphere; and ELVES, concentric rings of emissions caused by an electromagnetic pulse in the ionosphere. 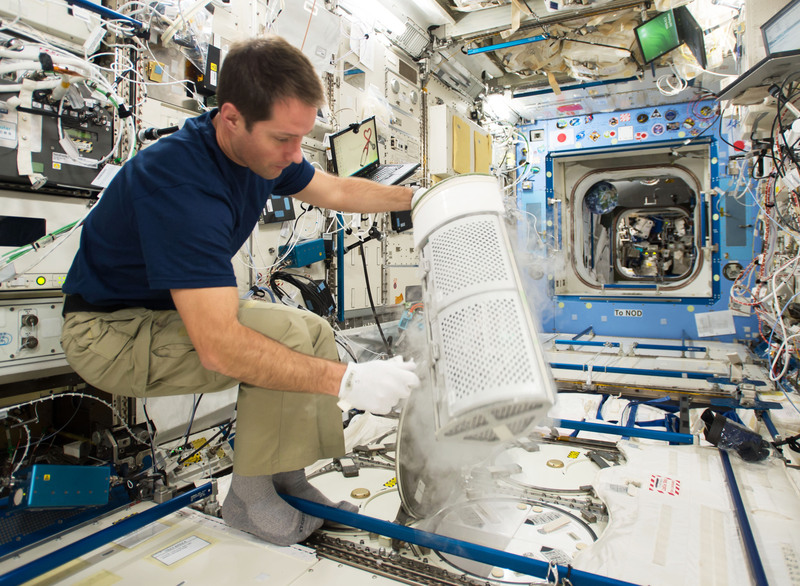 The NASA Sample Cartridge Assembly (MSL SCA-GEDS-German) experiment determines underlying scientific principles for a fabrication process known as liquid phase sintering, in microgravity and Earth-gravity conditions. On Earth, liquid phase sintering works like building a sandcastle with just-wet-enough sand. Heating a powder forms interparticle bonds and formation of a liquid phase accelerates this solidification, creating a rigid structure. But in microgravity, settling of powder grains does not occur and larger pores form, creating more porous and distorted samples than Earth-based sintering. European Space Agency astronaut Thomas Pesquet inserts blood tubes into the Minus Eighty-Degree Laboratory Freezer aboard the International Space Station on Nov. 21, 2016. These blood samples are integral to the MARROW study, which seeks to understand the effects of prolonged immobility on the human body. The study’s findings will benefit people on Earth who live with reduced mobility, including seniors and bedridden patients. The Materials International Space Station Experiment Flight Facility (MISSE-FF) provides a unique platform for testing how materials, coatings and components react in the harsh environment of space, which includes exposure to ultraviolet and ionizing radiation, atomic oxygen, charged particles, thermal cycles, electromagnetic radiation and micro-meteoroids. The testing benefits a variety of industries, including automotive, aeronautics, energy, space, and transportation. Wound Healing tests a patch containing an antimicrobial hydrogel that promotes healing of a wound while acting as a scaffold for regenerating tissue. Reduced fluid motion in microgravity allows more precise analysis of the hydrogel behavior and controlled release of the antibiotic from the patch. This novel patch could serve as a non-surgical treatment for military combat wounds and reduce sepsis, or systemic inflammation, usually caused by contamination of an open wound. Comparative Real-time Metabolic Activity Tracking for Improved Therapeutic Assessment Screening Panels examines effects of microgravity on the metabolic impact of five different therapeutic compounds, evaluating the use of autobioluminescent human tissue culture for continuous tracking of metabolic activity without destroying the sample. This investigation determines the feasibility of developing improved pharmaceuticals in microgravity using a new method to test the metabolic impacts of drug compounds. This could lead to more effective, less expensive drugs. Author Bob GranathPosted on April 2, 2018 Categories UncategorizedLeave a comment on What’s on Board Dragon for SpaceX CRS-14? A Falcon 9 rocket is being loaded with propellants in preparation for liftoff from Cape Canaveral Air Force Station’s Space Launch Complex 40, to boost a SpaceX Dragon resupply spacecraft to the International Space Station. Liftoff is scheduled for 4:30 p.m. EDT, for its 14th commercial resupply services mission to the space station. 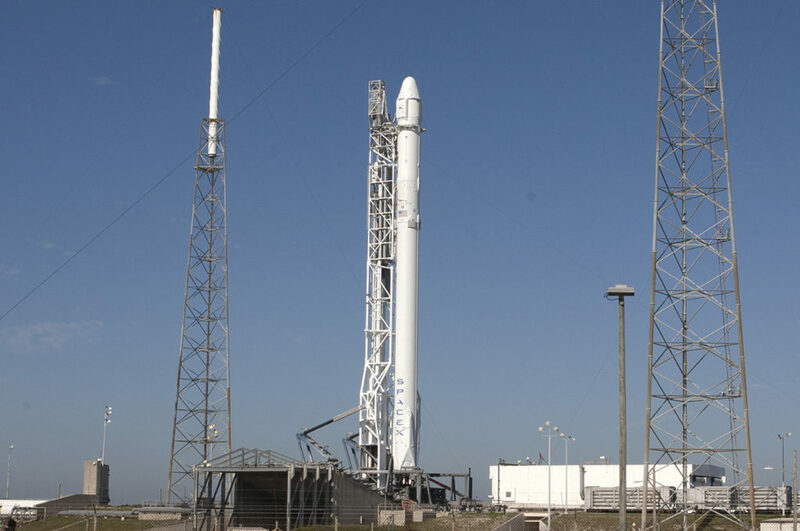 The SpaceX Falcon 9 is 230 feet-tall and has two-stages topped by the company’s unpiloted Dragon spacecraft. The rocket’s first stage is powered by nine Merlin engines that ignite at T-0. Its second stage has a single Merlin engine that takes over after separation of the first stage. 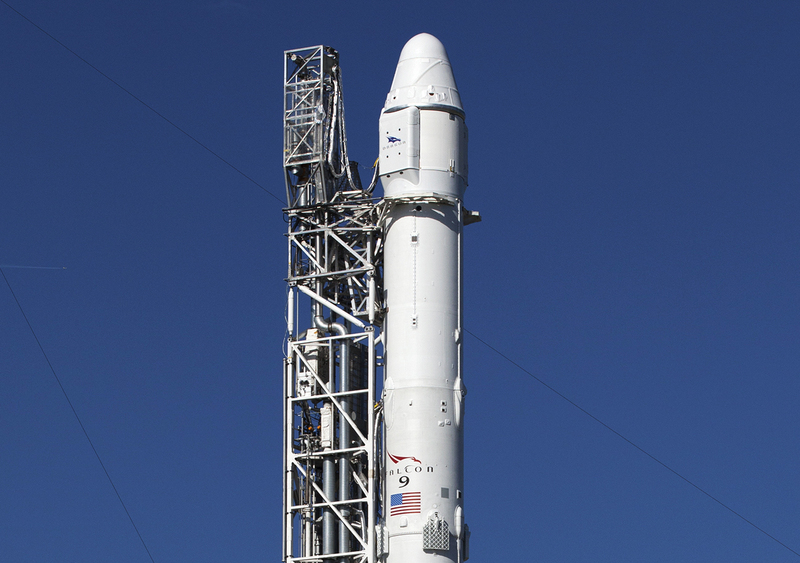 The engines run on a combination of super-cold liquid oxygen and the fuel, RP-1 — highly refined kerosene. Installed atop the rocket, the 20-foot tall and 12-foot diameter Dragon spacecraft is loaded with cargo bound for the space station. The Dragon offers a pressurized section as well as an unpressurized “trunk” section for additional cargo. Also located in the trunk are the spacecraft’s power-producing solar arrays, which will open shortly after Dragon arrives in orbit. Good afternoon from NASA’s Kennedy Space Center in Florida. A SpaceX Falcon 9 rocket and Dragon spacecraft are being prepared for liftoff from Space Launch Complex 40 at Cape Canaveral Air Force Station. Liftoff is targeted for 4:30 p.m. EDT today, with an instantaneous launch window. That means the launch must take place precisely on time in order to reach the orbit of the International Space Station. The official weather forecast from the U.S. Air Force’s 45th Weather Squadron at Patrick Air Force Base calls for an 80 percent chance for favorable conditions for launch today. The primary launch weather concerns are flight through precipitation and cumulus clouds with the showers. Today’s launch is a cross-country effort. 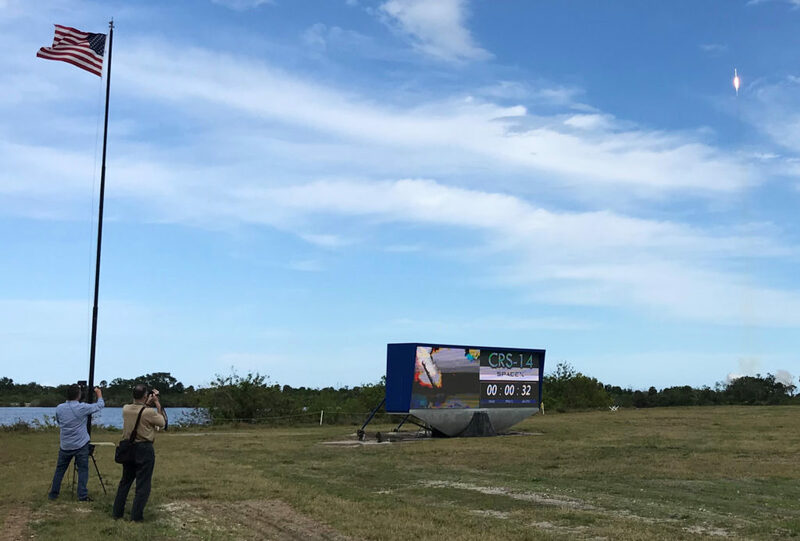 Launch controllers here at the Florida spaceport are working in concert with teams at NASA’s Johnson Space Center in Houston and SpaceX’s control center in Hawthorne, California. This launch blog originates from the NASA News Center, a few miles west of the launch pad, here at NASA’s Kennedy Space Center, the premier multi-user spaceport. A Dragon spacecraft is poised for liftoff atop a Falcon 9 rocket at Cape Canaveral Air Force Station’s Space Launch Complex 40. The launch vehicle will boost the resupply capsule on its 14th commercial resupply services mission to the International Space Station. SpaceX’s Dragon will deliver supplies and equipment supporting numerous science investigations for the crew working aboard the orbiting laboratory. Liftoff is scheduled for today at 4:30 p.m. EDT. Be sure to join us here at 3:55 p.m. EDT to follow this live blog-cast during the last stages of the countdown and early portions of flight. You also may follow the countdown on NASA Television (https://www.nasa.gov/nasalive) beginning at 4 p.m. EDT for updates.